'Jalte Badan' [review]; a film about the perils of drug addiction. They tend to be quite fun. 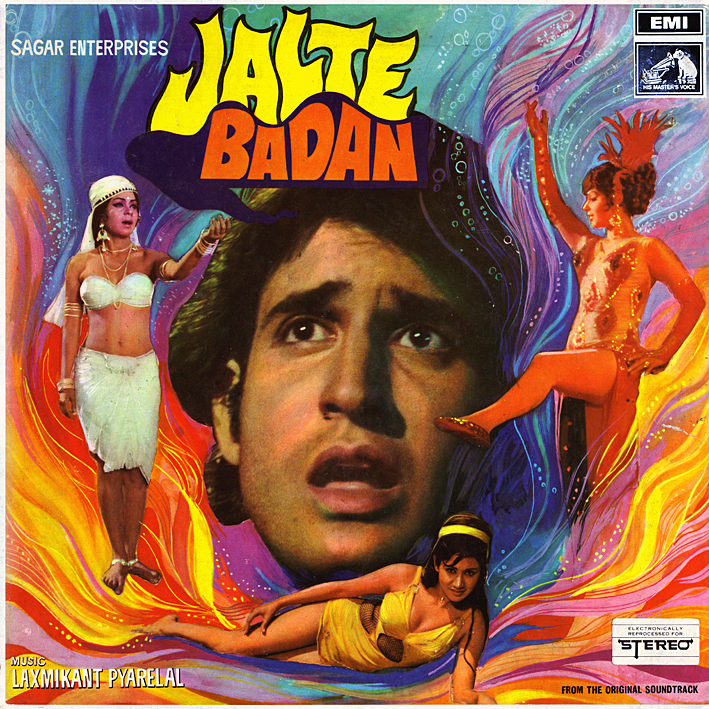 I don't know if the Bollywood ones were made with sincere intentions in mind or if they (too) were just exploitation, but either way, when trip-out songs were required for such films, music directors often excelled. 'Aag Se Aag Bujhale' is no exception. It starts with a long intro (sadly missing from the otherwise fantastic YouTube clip) that has the orchestra in a fast-paced and savage mood, sounding as if Keith Moon and Pete Townshend from The Who are guesting. And it continues with an utterly compelling melody, hypnotic and groovy, interspersed with demented (and loud) instrumental details. Fantastic stuff; if Punky Indian Soul Jazz were a genre, this is the track that would epitomize it. The whole soundtrack is excellent though; the instrumentals perhaps being the other highlights. Both "Titles" and "Fire Dance" are captivatingly dramatic, as is the ominous horror music making up the majority of "Vada Bhool Na Jana Pt. 2". I've never felt such sincere empathy for the drug addict as I did after this eye opening depiction of human tragedy and suffering. I think every young person should hear this before it's too late. Thank you so much. hi....seems that u recd the "Apradh" LP....is it possible to upload that? Erm... other than what's previewed on Flickr and Facebook, how do you know which LPs I've received? Ah, right. Actually, I've removed a couple of titles from the want list, not due to having located copies, but because I don't want them anymore. Shararat I don't even know what is, so I don't think that has ever been on the list. That said, I do have Apradh, and it will be posted at some point.